Ted Gioia, in his book The Jazz Standards, says that Body and Soul “is the granddaddy of jazz ballads, the quintessential torch song, and the ultimate measuring rod for tenor sax players of all generations. Even in the new millennium, this 1930 composition continues to serve as the cornerstone of the repertoire.” Louis Armstrong recorded the song first, followed in the 1930s by recordings from primarily white society bands, such as those led by Paul Whiteman. That said, some early recordings by jazz artists including Benny Goodman and especially Art Tatum started to cement this song as a serious jazz standard (in fact, it’s rated #1 on the jazzstandards.com website). However, the Coleman Hawkins recording from 1939 is widely acknowledged to have made the song a true jazz standard. The Hawkins recording was followed by great jazz recordings by Charlie Parker, John Coltrane, Charles Mingus, Thelonious Monk, Art Pepper, Dave Brubeck and many more. Fine vocal recordings include those by Billie Holiday and Tony Bennett. “Body and Soul” was recorded in May, 1989 and was released the following year on Astoria: Portrait of the Artist. It was arranged and conducted by Jorge Calandrelli. “Body and Soul” was recorded and televised live on April 12, 1994 on MTV. The MTV Unplugged album was released in June of that year. 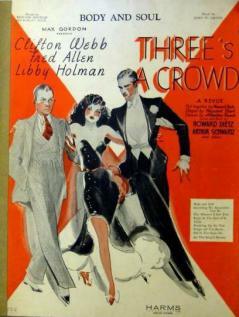 The songs from the televised concert were arranged by Tony Bennett and the Ralph Sharon Trio. “Body and Soul” with Amy Winehouse was recorded in 2011 and was released that year on Duets II. It was arranged by Jorge Calandrelli.